If you were to take every battery in California, including car batteries, you would get only 30 minutes of energy supply needed for the whole of California. 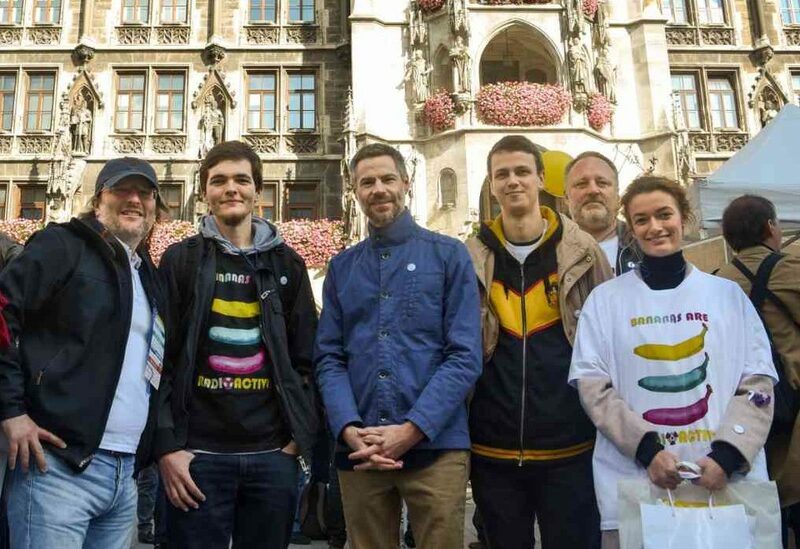 In autumn, in the historic centre of Munich, a Nuclear Pride demonstration was held, a peaceful manifestation of mostly young people from around the world to support nuclear power. 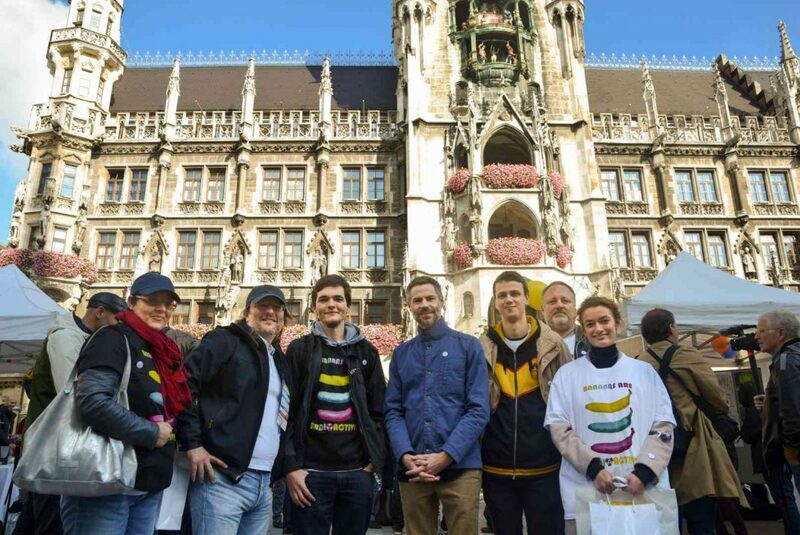 These young people called on Germany to not give up its nuclear power plants. We met there with the leading environmentalist Michael Shellenberger. What are the consequences Germany will feel when it decommissions its nuclear power plants? If you need proof that you cannot solve climate change just with the aid of solar and wind power, Germany is a showcase example. Carbon emissions in Germany have not fallen for nine years now; instead of nuclear power they are using coal and natural gas. Germans have spent $580 billion on investments in renewables, yet their emissions have not fallen. This is interesting and it is now beginning to be picked up also by German media. 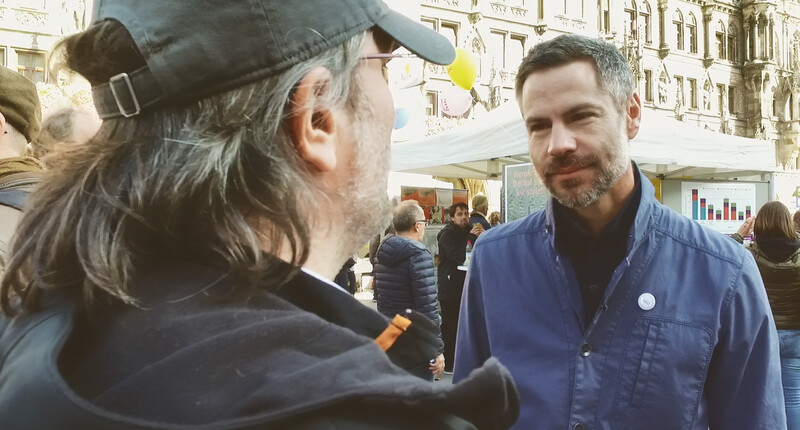 Miroslav Šarišský from Slovenské elektrárne interviewing Michael Shellenberger. How to convince the Germans not to switch off their nuclear power plants? The Germans are now beginning to convince themselves. Currently there are protests in the Hambach forest, which they want to destroy in order to exploit the coal under the forest there (editor´s note: these are the remnants of a 12 000 year-old forest; further coal extraction has, for now, been suspended by the German courts). They have also demolished an ancient church. Germans themselves are realising that they are destroying their own heritage in order to exploit coal, and they are destroying their reputation as regards the climate. There is also appearing among them an irrational fear of nuclear power, the has more to do past, with the Cold War and with the fear of nuclear weapons. Even I myself was once against nuclear, but at the time I didn’t know anything about it. I have changed my opinion about nuclear, and the more I learn, the more positive I am about this technology. That’s why I am optimistic that Germans can change their opinion. Is wind and sun enough to combat climate change? Wind and sun makes sense, but if you really want to get rid of fossil fuel dependence and on imported natural gas, then you need a lot of power from nuclear. In Europe almost half of energy from renewables comes from wood, which is several times more than wind or sun. It is quite simple. If you want to protect the environment, you cannot destroy and burn it to obtain energy. So we should rather leave our forests untouched as far as possible, and not use them for fuel. Nuclear power is an environmentally sustainable source of energy, because only a small amount of uranium can produce a huge amount of energy. Energy density is key to environmental protection. What the Germans are doing is heading in the opposite direction. In order to produce energy they are using increasingly more land for constructing solar and wind power plants and burning more and more wood. The sun provides still only less than 10% of electricity Germany. Efforts to have renewables are making headway. They cannot ensure adequate capacities from wind, because at one time they have too much wind power that they do not need and at other times too little, when they do need it. Won’t batteries be the solution? I will give an example from California, where I come from, and which is similar to Germany. We have invested greatly in renewables. If, though, you were to take every battery in California, including car batteries, you would get only 30 minutes of energy supply needed for the whole of California. You can, though, store energy not just for a few minutes, but possibly for several weeks or months. No one seriously believes that putting so much electricity in batteries is realistic.